The Dr Shezad Malik Law Firm helps folks get the recovery they need after developing Benzene related cancer and leukemia. If you or a loved one have been exposed to Benzene and developed a form of leukemia or other blood related disease such as acute myelogenous leukemia (AML), myelodysplastic syndrome (MDS), or non-Hodgkin's lymphoma (NHL), you should contact us immediately at 888-210-9693 ext 2, 214-390-3189. We handle Benzene Leukemia cases nationwide, including California, Florida, Illinois, New York, and Texas. If you have Leukemia (AML, acute myelogenous leukemia, ALL, acute lymphoid leukemia, CML, chronic myeloid leukemia, or CLL, chronic lymphoid leukemia), Non-Hodgkin's Lymphoma, Aplastic Anemia, or Myelodysplastic Syndromes (MDS) and you were exposed to Benzene we may be able to bring a lawsuit on your behalf against the manufacturers of products containing benzene. Benzene is an aromatic hydrocarbon that is produced by the burning of oil based products. It is a component of products derived from coal and petroleum and is found in gasoline and other fuels. Benzene is used in the manufacture of plastics, detergents, pesticides, and other chemicals. Medical research has shown benzene to be a carcinogen (cancer-causing). With exposures from less than five years to more than 30 years, victims have developed and died from leukemia. 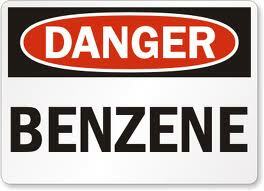 Short-term exposure to high levels of benzene can cause drowsiness, dizziness, unconsciousness and death. Benzene exposure occurs in general industry, shipyard employment, and the construction industry. Individuals employed in these industries include benzene production (petrochemicals, petroleum refining, and coal chemical manufacturing), rubber tire manufacturing, and storage or transport of benzene and petroleum products containing benzene. Others who may be exposed to benzene include steel workers, printers, rubber workers, shoe makers, laboratory technicians, firefighters, and gas station employees. Benzene is made of coal tar and is a well-known carcinogen (or a cancer-causing chemical). Benzene is used as a base in making chemicals and plastics, but it is most often found in solvents and degreasers. Benzene is also used to make commonly used products like drugs, rubber, lubricants, dyes, detergents and pesticides. Benzene is an industrial chemical/solvent that has been associated with many fatal forms of cancer, leukemia and catastrophic blood conditions, such as Acute Myelogenous Leukemia (AML), Chronic Myelogenous Leukemia (CML), Acute Lymphocytic Leukemia (ALL), Chronic Lymphocytic Leukemia (CLL), Hairy Cell Leukemia (HCL), Non-Hodgkin’s Lymphoma, Multiple Myeloma, Myelodysplastic Syndrome (MDL), Myelofibrosis and Myeloid Metaplasia, Aplastic Anemia and Thrombocytopenic Purpura. If you or a loved one have been exposed to benzene and developed a form of leukemia or other blood related disease such as acute myelogenous leukemia (AML), myelodysplastic syndrome (MDS), or non-Hodgkin's lymphoma (NHL), you should contact us immediately. Information and commentary provided by Dallas Fort Worth Personal Injury Attorney Dr Shezad Malik. The Dr Shezad Malik Law Firm can be contacted in Dallas toll free at 888-210-9693. If you or a loved one has been injured from Benzene exposure, please fill out our contact card for a free consultation. Illinois Asbestos Lung Cancer Lawsuit Betty Ruth Rhodes, from Illinois, has filed a lawsuit against 65 different companies, alleging that she contracted lung cancer from asbestos exposure.